The surprise Japanese attack on the US led to tremendous upheavals – on both international and personal levels. 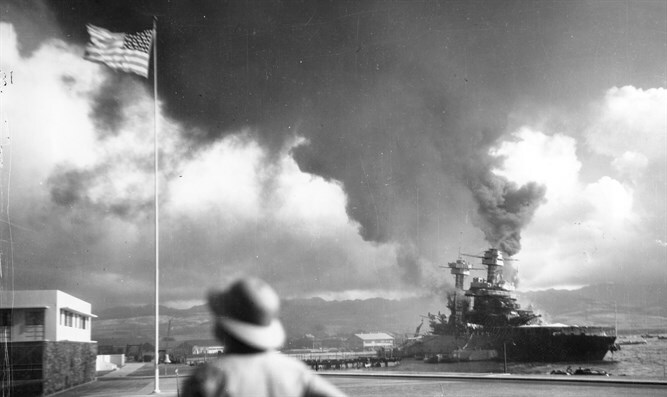 The world marked the 75th anniversary this week of arguably the single most pivotal international event of the 20th century: The Japanese surprise attack on the United States naval base at Pearl Harbor, Hawaii, in 1941. It was this that triggered the United States' entry into World War II, leading to the defeat of the Nazi empire in Europe and, ultimately, to the end of the Holocaust – and even the establishment of the State of Israel. Volumes have been written about the Pearl Harbor attack, what led up to it, and what it led to. Isolationism in the United States carried the day at the time, and it is likely that the Americans would not have entered the war for at least many more months, if at all, had not the Japanese attacked. Yisrael Medad, Director of Educational Programming and Information Resources at the Menachem Begin Heritage Center in Jerusalem, says that, from a Jewish-Israeli viewpoint, it must be emphasized that "the US policy of neutrality that was being pushed by anti-Semites (who called the European war the ‘Jewish war’) was literally killing Jews in Europe." The Pearl Harbor attack meant that "finally, a non-Jewish reason to join the war made itself available." In fact, the murder of tens of thousands of Jews in Poland and elsewhere was already well underway by 1940, over a year before Pearl Harbor. Medad also states that the dramatic surprise attack also led to increased public American support for the war, and Zionist organizations consequently assumed a larger role in American Jewish internal politics. Thus, the Japanese attack on Pearl Harbor ultimately had a major impact, not only on world history in general but on modern Jewish history in particular. Another viewpoint on these events was provided by Howie Mischel, a recent immigrant to Israel from the United States whose father was seriously wounded in the Battle of the Bulge in Belgium (late 1944-early 1945). Mischel's interest in this period has been chiefly motivated by a series of providential coincidences <http://jewishstandard.timesofisrael.com/battle-of-the-bulge/> that befell him. These led him not only to a deep appreciation of the rank-and-file who actually fought the war to defeat the Nazis, but also to visit Belgium to learn about the battle and see the all-but-forgotten gravesite of his father's best friend Sid Mosner, who fell in battle there at the age of 19. "It was the beginning of the long chain of events that led to a massive upheaval around the world, changing the lives of millions upon millions of people across the world. Personally, it deeply affected the history of my own family; my father joined the military because of it, totally changing my family's entire history. The same thing happened for many, many families, in which people responded to the need of the hour and simply stepped up to the plate and did what they needed to do. I believe a must read-for everyone is Tom Brokaw's book The Greatest Generation, in which he paid homage to these soldiers and how they essentially saved the world." A7: Would you agree that to some extent, the attack on Pearl Harbor is a day of salvation for the Jewish People, in terms of ending the Holocaust? HM: "I don't really look at it that way. In terms of how the Americans responded to the massive murder of Jews, it is well-documented that that the US military didn't exactly rush to help destroy the railway tracks to the concentration camps, nor were the American immigration policies designed to help very much. It wouldn't occur to me to think that this was the beginning of the end of the Shoah." A7: "In the days and weeks following Pearl Harbor, Japanese in the United States were placed in detention camps. How do you view this?" HM: "They were perceived as an 'enemy within,' and this seemed to be the logical thing to do at the time. The more modern viewpoint, of course, is that it was wrong to do this, but this is a form of revisionism that uses a different lens to view past events." The days and weeks preceding the Pearl Harbor attack have important lessons for us today, according to thinker and publicist Yishai Fleisher, the international spokesman for the Jewish community in Hevron. He notes that the Japanese eventually regretted attacking America, because it actually brought the US into the war instead of keeping it out. "Sometimes the darkest hours are the ones that lead to the rebirth. For the Jewish People, the Holocaust was the precursor to the rebirth of Israel; for the US, the horrible fires of Pearl Harbor was the prelude to great victory - and just like Japanese imperialism and Nazism were ideologies that had to be totally defeated, so, too, must the Jihad of today be totally vanquished."